I’ve been having a Castlevania itch lately. Between trying to main the Belmonts in Super Smash Bros. Ultimate and watching my wife play through Metroidvanias like Symphony of the Night for the first time, I’ve been eager to do some demon slaying. Brazilian indie developer Joymasher has effectively scratched my itch with Odallus: The Dark Call, a retro-platformer inspired by Castlevania III. A brief, pixelated opening cutscene reveals the plight of Haggis, a man who loses his son and discovers his town has been set on fire by monsters. Aside from some dialogue boxes and hidden lore, that’s as much story as the game provides. A simple plot isn’t the only shared aspect between Odallus and old Nintendo games. The rich, detailed 8-bit graphics and gothic rock chiptunes will immediately conjure up nostalgia for anyone who has grown up with the NES. Even the screen replicates old tube TV displays; the action takes place on a 4:3 box in the center, and the side menus curve a little. 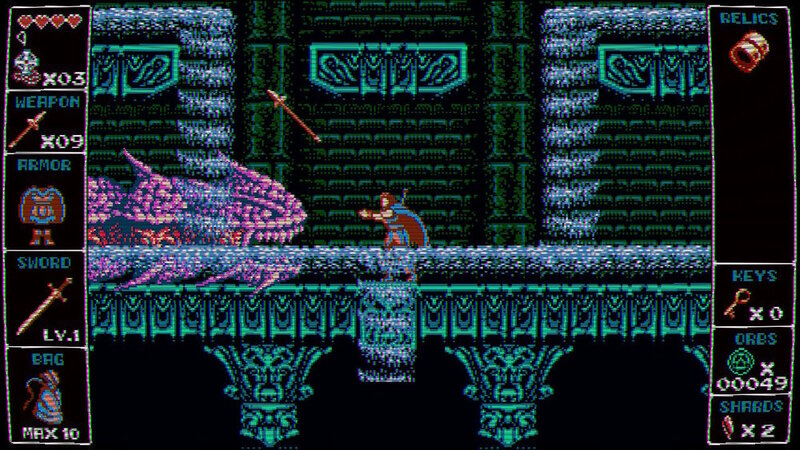 Odallus’s dark, atmospheric stages look like classic Castlevania, but the gameplay isn’t as frustrating as notorious “NES-hard” titles. Like Konami’s 8-bit vampire hunters, Haggis runs, jumps, and brandishes his weapon (a sword instead of a whip), but he moves much swifter and less clunkily. The responsive controls foster smooth gameplay, and the only downside is a lack of customizable button inputs. You jump with the Nintendo Switch’s A button and attack with the Y button, which is awkward to perform due to their placements on the controller. I got used to it eventually, but it’s unlike any other platformers I’ve played. Other than that snag, combat is fast, and a variety of ghoulish enemies and gameplay shifts, such as minecart rides, keep the experience fresh. There are nine stages, but progression through them isn’t linear. Every area hosts multiple paths that converge and branch out again. Each path has its own challenges, but they all eventually lead to a boss. Slaying a boss opens up the next stage, but as I soon found out, that isn’t enough to beat the game. Almost every level has a devious secret exit, and finding all of them is mandatory to reach the ending. Typically, you need to find a special power-up – such as the power to move blocks – in a later stage, then return to an earlier area and use it to uncover hidden paths. There is a fair amount of backtracking, but I embraced it thanks to the level design. 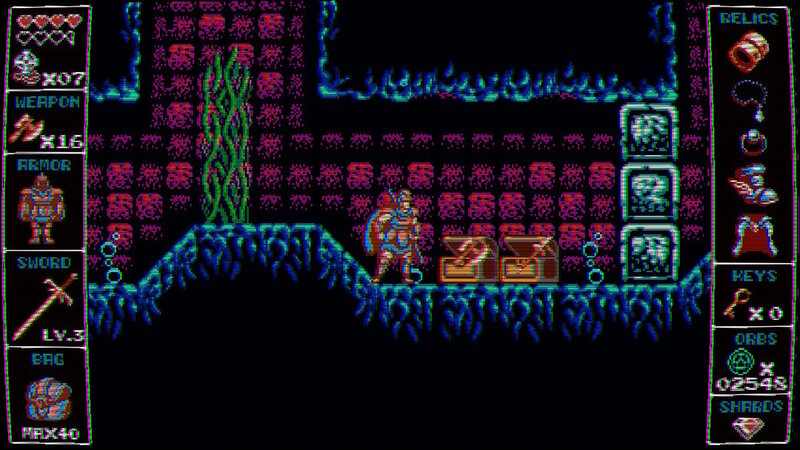 Unlike more linear sidescrollers, each stage in Odallus promotes open exploration. I’m free to go anywhere in each 2D area, provided I have the power-ups to reach it. I may find upgrade rewards awaiting me after difficult platforming segments, secret exits from vigilantly scanning the environment, or new subweapons because I solved a puzzle. The subweapons are similar to those of Castlevania, but you can freely switch between them. I was motivated to go back to a level multiple times, exhaust its rooms, and return whenever I gained a new ability. The game cunningly masks a deep, addictive Metroidvania progression behind its seemingly linear structure. What I most appreciated was how the developers respected my time. Unlike many old games that restart as soon you reach a game over, Odallus constantly saves your progress. If you lose all your lives or manually leave a stage, you retain all your power-ups and upgrades. This also applies to unlocked doors, solved puzzles, and defeated mini-bosses, which honestly astounded me, as I was expecting to redo entire segments upon death. Consequently, Odallus is thankfully not frustrating, but it’s also not too long or tough. I spent about eight hours with the game, and that includes revisiting levels and locating all secrets. Luckily the game directly informs you how many secrets are still hidden per stage. It’s a fairly meaty playtime, though I admittedly wanted more. As for the difficulty, the game never feels cheap, as there are no annoying instant kills here. My biggest challenges were against the bosses, who exhibited all the properties I seek in end-of-level showdowns. Defeating them requires superprecise timing, pattern recognition, and a good eye for weak spots. Besides the final boss, I found the difficulty to be fair. I even felt encouraged to try out the harder Veteran mode, which beyond introducing harder enemies earlier, also switches up item placements and puzzles, significantly altering the game. Unfortunately, I experienced slowdown and a few glitches, like literally falling out of the level and having to restart. It’s a shame that Odallus occasionally suffers from some of these common NES problems, but it didn’t detract too much from my overall enjoyment. Odallus may look like an NES game, but it plays and handles progression like contemporary titles, respecting the player’s time and offering numerous secrets in an exploration-based 2D world. I went into Odallus: The Dark Call looking for Castlevania and left with an engaging experience that pays tribute to both classic 8-bit titles and modern Metroidvania games. Shovel Knight: Specter of Torment is one of the best launch games the Nintendo Switch currently has to offer. As far as platformers go, the only better option would be to plop money down and get the full Shovel Knight: Treasure Trove experience, which bundles this in. Specter of Torment is such a solid feature-filled game on its own that you wouldn’t guess it was a DLC expansion. Yacht Club Games has outdone itself retooling an already excellent game with new satisfying acrobatic thrills. 88 Heroes is an example of quantity over quality.While the game isn’t necessarily GR8, I didn’t H8 it, and there’s some value to be found for 2D sidescrolling fans or anyone who’s willing to pay for a good laugh. Dream Alone is one of the darkest games I have played. It’s not because of its chilling storyline, creepy atmosphere or horrifying imagery. Rather, the game display is literally so dark that it’s sometimes hard to see the screen. When factoring in obscured death traps and poor level design, the issues turn this dream into a nightmare. In a saturated market of non-linear Metroidvania games, Drinkbox Studios’ Guacamelee stood out for its emphasis on Luchador wrestling brawls and platforming challenges, all with a colorful Mexican flair. Years later, the developers revisit the formula with Guacamelee 2, a solid - albeit iterative - sequel. Oh, and you can play as a chicken.